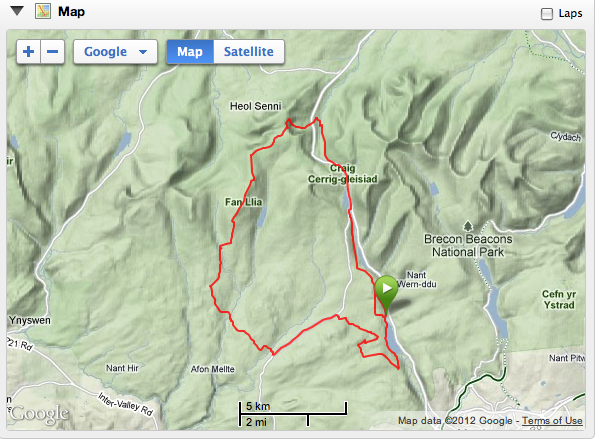 I had a great run last Friday heading west from the A470 to the quieter tops north of Ystradfellte. I headed off early and parked the van at the Garwnant Visitors centre - 7:30 and the temperature gauge was reading -8.5C. 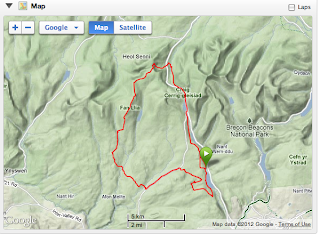 I warmed up with a loop around the forest and then headed over open moorland toward Ystradfellte. The snow was knee deep in parts and I was reliant on the animal tracks to get me across this section safely. If the ground hadn't been frozen solid, it would have been a miserable plod through deep bog, but it was a frozen morning and so the going was much easier. The village of Ystradfellte is very pretty, tucked away between hills, and if it wasn't for the other 20 miles ahead of me and the limited daylight, I would love to have tried out the pub there and taken a detour to view the waterfalls. But time was short so I plodded on towards Fan Llia and onto the ridgeway that would deliver me back on to the Taff Trail near Storey Arms. Whilst on top I was joined by a couple of fighter jets who passed over me twice to say hello - the only contact I'd have all day. The snow was knee deep on top and had drifted in places so the going was slower than I'd hoped. My Inov8s were frozen solid and the feed pipe from my water bladder was also rendered useless having frozen within half hour of setting off. At one point I thought the wire from my earphones had somehow become tangled in my hair, but realised that my hair had frozen and I had 3 icicles attached to my locks! 27 deserted miles covered comfortably within daylight hours, around an area that is stunningly beautiful particularly with a covering of snow, and a route that introduced me to new areas and tracks. Respect Sarah! That's a mighty run. Great pics too. Great run Sarah and fabulous photos to boot!